Ragnar Lothbrok, Erik Bloodaxe and Harald Hardrada are a trio of legendary Viking warriors. Towards the end of their careers, each man sailed his longships upriver to Jorvik, or York. Not one of them survived to make the journey home. The first to die was Ragnar Lothbrok (or Shaggy Breeches). The verdict is still out on whether there really was a historical Ragnar, but the lurid account of his death was enough to put York on the map as far as the Viking Sagas were concerned. Ragnar’s time was up when he was shipwrecked off the Yorkshire coast and fell into the hands of King Aella of Northumbria. Aella was a full-blooded historical figure whose rule of northern England was attested by the Anglo-Saxon Chronicles. But he ruled a kingdom that was politically unstable: for several generations, it had suffered from Viking raids, starting back in 793 when the longships swooped down on Holy Island (Lindisfarne) the spiritual powerhouse of Northumbria. So the king was in no mood to offer hospitality to any stranded Vikings and when Ragnar refused to give his name, Aella threw him into that most unlikely of Yorkshire settings – a pit full of snakes. If we can believe the sagas, this wasn’t Ragnar’s first encounter with a serpent either. Stories have him fighting a dragon as a young man, and surviving only because he boiled his clothing in pitch beforehand. How lucky then that he was still wearing the same protective clothing and King Aelle’s snakes proved powerless against him! But the magic left as soon as Ragnar was stripped of his clothes and the snakes crowded in for the kill. With the venom entering his bloodstream, the dying man then made a terrifying prophecy – that his sons would descend on York to avenge their father’s death. 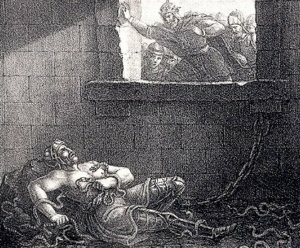 If the saga version of Ragnar’s death is fiction, then the Viking capture of York is undisputed fact. English sources identify an Ingwar as a leader of the “Great Heathen Army”, but it’s the sagas that take us that tantalising step back to Ragnar himself by identifying this Ingwar as one of the sons of Hairy Breeches himself – Ivar the Boneless. York fell to the Vikings in 866 and King Aella himself died six months later in an unsuccessful attempt to retake the city. The Saga tradition, however, begs to differ and has the Northumbrian King taken alive for the son of Ragnar to torture him to the Viking version of death by a thousand cuts. According to historian Roberta Frank, however, the notorious “blood eagle” is actually a sensationalist misreading of Viking poems gloating on the birds of prey picking over the defeated Aella’s corpse. In the end, how King Aella died is irrelevant. With the native line of kings gone, the family of Ingwar/Ivar the Boneless ruled York for the next half-century until they too were supplanted by a new King arrived from Scandinavia. This was Erik Bloodaxe, who had earned his moniker from the ruthless elimination of the four brothers who stood between him and the throne of Norway. The political turmoil in Norway eventually forced Erik to find a new kingdom overseas. Not all historians are convinced that Erik actually washed up in York and, such is the paucity of the sources, it is more than possible that the king of that name striking coins in the 940s was someone other than Bloodaxe. The Sagas, however, were in no doubt and immortalised him sitting in his royal hall in a rain-soaked Jorvik with his wife, the equally ruthless Queen Gunnhild, at his side. Erik did not have a peaceful time in York. The displaced Ivarrsons were never far away and both Scandinavian rivals were now under threat from a third challenger coming up from the south. King Eadred, grandson of Alfred the Great, was close enough to cast a long shadow over Northumbria itself. Erik was an obstacle to the unification of England and when he fell victim to the snake pit of Northumbrian politics – ambushed and killed by local rivals in the Pennines in 954 – King Eadred locked the kingdom of York into the new kingdom of England. A century later, that achievement came under threat. It was exactly 200 years since the fall of York to the Vikings. The year – of course – was 1066. The city now boasted 15,000 souls, making it the second biggest in England, but that was never going to overawe the next Norwegian King to come to York: the giant and indisputably historical Harald Sigurdsson. In his youth, he had seen the glories of Constantinople, the New Rome. There Harald learned his trade as an officer in the elite Varangian Guard, with the ageing Empress Zoe as one of the female admirers of his oversized physical charms. Back in Norway, he claimed the throne in 1046 and then spent the next two decades justifying his nickname of Hardrada, or Hard Ruler, of the Norwegians. When the English throne fell vacant with the death of the childless Edward the Confessor in January 1066, Hardrada was inevitably one of the hard men making a bid for the crown. Harald – the “thunderbolt of the North” – arrived in the Humber estuary with 300 ships in September 1066. He was planning to take advantage of the uncertain loyalties of the northern elite: an elite who, just twelve months earlier, had been threatening to secede from the English kingdom again. Their beef was with their earl, Tostig Godwinson and the threat to withdraw their loyalty to the crown had been serious enough for Tostig’s most powerful ally to withdraw his support: his own brother Harold, Earl of Wessex. A few weeks later, Tostig watched from exile as his brother was elected as King Harold II. Licking his wounds, he withdrew to Norway, but now he was back – joined with Hardrada in the invasion of England and the overthrow of his own brother. As always, control of York was the key to controlling the north. The invasion started well, with the Norwegians defeating the local forces at Fulford on 20 September 1066. The city prepared to submit, and hostages were gathered from across the shire, to be handed over five days later at the traditional assembly point of Stamford Bridge. But instead of hostages, the Norwegians relaxing in the sun were greeted with the cloud of dust that heralded the arrival of a second English army, force-marched up from the south. The day ended with Harold Godwinson fulfilling his promise to give his Norwegian namesake six feet of English ground and no more. Any chance of reviving the Viking kingdom of York died with Hardrada that September day. He was the last of the great Vikings to come to York. Marie Hilder is a freelance writer.